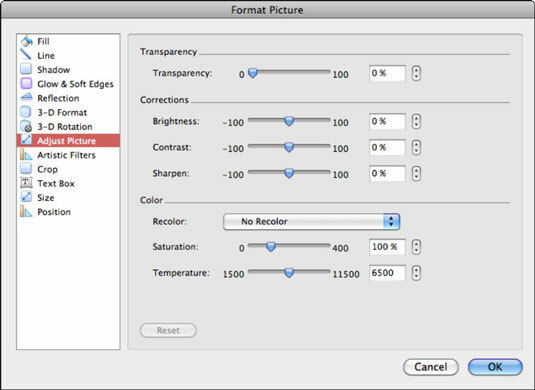 So you’ve added pictures to your Office 2011 for Mac document, workbook, or presentation — but the pictures need correcting. No worries; Office 2011 for Mac offers easy-to-use correction options on its Ribbon. When you click a picture, Office for Mac lets you know your picture is selected by putting light blue resize handles around the edges, and the green rotate handle appears at the top. At the same time, the Ribbon spawns a Format Picture tab. Remember that you must click the purple Format Picture tab to display the entire set of formatting controls on the Ribbon. The Corrections button displays a preview of your picture within a gallery of adjustment increments. Hover the mouse cursor over a preview to see how much adjustment you would get if you chose it. Transparency: Change how much you can see through the picture. 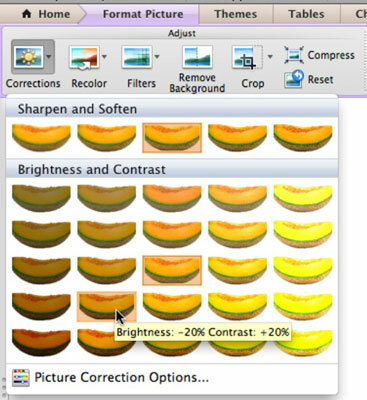 Corrections: Adjust brightness, contrast, and sharpness. Brightness: The amount of light in the picture. Contrast: How much difference there is between light and dark areas of the picture. Sharpness: How fuzzy or “in focus” the picture looks. Color: Change green leaves to blue or whatever color you want. Recolor: Choose grayscale, black and white, sepia, gray, and color tones from this pop-up menu. Saturation: Adjusts how rich the colors will be. Temperature: Color temperature is pretty complicated to explain here. But you can still play around with this tool and experiment to see whether you can attain a visual effect you like.